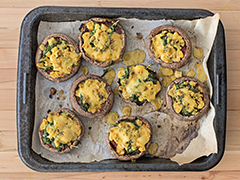 Stuffed portobello mushrooms topped with our favourite vegan cheese make for a healthy alternative when pizza cravings hit! Served with herbed mushroom quinoa for a filling and delicious meal. Best prepared within 2 days of delivery. Preheat oven to 425°F. Put 1 cup of salted water and 1 tbsp of the Italian herb mix into a small pot with the quinoa and bring to a boil. Reduce to a simmer for 10 - 15 minutes until all liquid is absorbed and remove from heat. Remove the stems from the mushrooms and scrape out the gills. 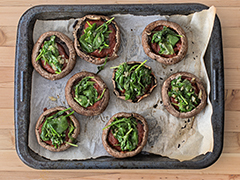 Place mushroom caps on parchment lined baking sheet and bake for 10 - 12 minutes. While the mushroom caps and quinoa are cooking, dice the mushroom stems and gills. Dice the shallot. Dice the Gusta vegan cheese*. Heat ½ tbsp of oil in a small pan over medium-high heat and add shallot. Saute until translucent (about 3 minutes), add kale, and cook 5 more minutes. 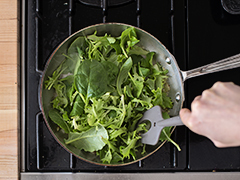 Move kale from pan to a bowl, keeping the pan on the heat. 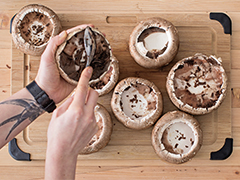 Remove mushroom caps from oven (turn the oven to “broil”). Add more oil to the pan (about 2 tbsp) and add mushroom stems and gills. Sauté for about 5 - 7 minutes, until soft. Add in the cooked quinoa and ¼ cup of water and cook, stirring frequently for another 5 minutes or until the water is absorbed. Tip the liquid out the mushroom caps. Divide sauce evenly among the mushroom caps, top with sautéed kale and diced vegan cheese. Sprinkle herb mix over top to taste, and put them back in the oven to broil for about 3 minutes, or until vegan cheese is melty. 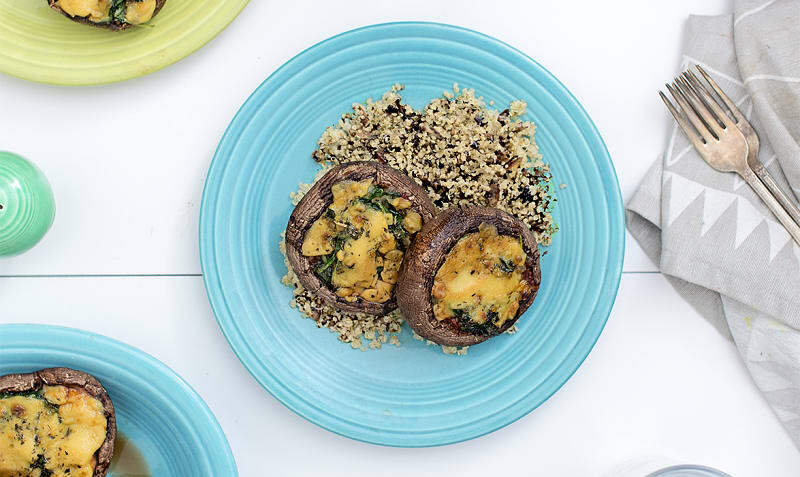 Serve two stuffed mushrooms per plate with the herbed mushroom quinoa. *If cheese is still frozen when it arrives, put it (still wrapped) in a bowl of hot water for around 10 minutes to thaw.